We take a look at Rocky Mountain Decals fantastic range of removable wallpapers and decals – used by interior stylists and designers all across the globe. For the commitment phobe or renter, wallpaper can seem a little daunting or unattainable. If you change your mind every few months on decorating styles, locking in a wallpaper design probably seems a tad scary to you. But what if you could get the wallpaper you love, without the life-long commitment? Rocky Mountain Decals create beautiful removable wallpaper and wall decals so you can change your room’s look up on a whim, and without the fear! You can simply peel the wallpaper off the wall when you want to change things up. Interior stylist and photographer (and not-to-mention – Instagram superstar) Tarina Wood of Oh Eight Oh Nine has been using Rocky Mountain Decals for some time – in particular, in her client’s kids’ bedrooms. What I love about rooms for little ones, is that they tend to be a little more bold and adventurous with colour choice – and you certainly can have a lot of fun with the removable wallpapers in their range. These four examples of kids’ rooms, all designed by Tarina are so whimsical – she even has a wallpaper named after (see opposite)! But the range isn’t just limited to kids’ bedrooms – you might recognise these two stunning spaces as featured in our new Renovation Edition below. Rachael Turner of Front Porch Properties opted for this delicate peony flower wall decal from Rocky Mountain Decals for the master walk-in-robe. Each individual sticker was applied to the wall to give a free-flowing feel – isn’t it beautiful! And in the second living room, she chose the Palm Trees Wallpaper – Rachael describes it as her favourite feature in the room and easily installed it herself – all you have to do is simply peel off the backing paper and stick the wallpaper against the wall (no need for glue, paste or water). And if you ever decide you want to change it up for another wallpaper, you simply peel it off without damaging the wall. Too easy! Click here to shop Rocky Mountain Decals’ wallpaper range. Our resident product and content assistant (and not to mention fabulous interior decorator) Kate Moss shares with us the four magic S-words to achieve the bedroom of your dreams! For the room in the house that we use to recharge, sleep and have some down time, bedrooms need to be a place of relaxation and calm, a sanctuary you can step into and instantly relax. Ensure you have the correct lighting – natural, task lighting (for reading) and enough overall light for the entire room. Create a little nook with an occasional chair or small lounge that you can use to relax in, read a book or throw yesterday’s clothes on. This adds personality and character to the space and helps to create a focal point away from the bed. Where possible, consider using curtains instead of blinds for a luxurious and elegant vibe and to block out the light. We recommend sheers that pool at the bottom for that extra bit of softness. Add some greenery, but ensure you select plants that will suit the lighting availability in your space. Indoor plants have lots of health benefits and help bring the outdoors in, creating a relaxing and calming space. You can use them hanging from the ceiling, on the window sill and sitting on the floor, shelf or bedsides. Texture, texture, texture. Nothing speaks relaxation like thick furs and soft velvets. Start your bedroom styling off by choosing a feature item (colours, patterns, texture) then work on adding layer after layer from here. Start with a piece of artwork you can draw colour from, a stand out cushion or a deluxe bedhead. Choose colours that are easy to mix and match so that when you are wanting to update you don’t have to do a complete overhaul and the items can easily be restyled for a fresh look. Using a natural base, I find soft colours like sage and blush work well with lots of other colours and are easy to pull together with deep tones and varying textures, making the restyling process efficient and affordable. From here, add some bedding that complements the colours and textures already being used. I like to start with a neutral quilt cover that draws on texture more than colour. I then like to match at least one set of pillowcases or euros with the quilt cover for some balance and draw colours from the artwork or cushions in the throws, creating a visually pleasing aesthetic. Rugs are a great way to add texture and soften the room, especially if you have floorboards or concrete. There is nothing worse than rolling out of bed on to a freezing cold, hard floor. Be mindful of the space you are working with and don’t try to over-complicate it. If you can only fit a queen bed in, don’t try to make a king bed work. Also take in to consideration the amount of space you have for bedside tables. For larger rooms you can be a bit more adventurous with size and scale but for smaller rooms, get creative by using a stool or side table in place of a bedside like pictured above. Ensure you have enough height in the space. I find a lot of bedroom furniture can sit at one level so it is important to introduce some taller standing items to draw the eye upwards. This also helps give the illusion that the ceiling height in the room is higher than it actually is. For example pictured above in both of these bedrooms, the large-scale pendant light/s draw the eye up and create height in the room. I also recommend using items like a ladder, floor standing mirror or tall plant. You could also get creative with artwork and wall hooks to draw some height in to the space. Your bedroom should be a space that is free of clutter and mess so clever storage solutions are essential to ensure your mind is clear when trying to relax and go to sleep. If you are lacking space, use creative storage solutions like a leaning ladder, slim wall shelving, under bed storage or a bench seat you can fill with excess items. Make sure your bedside tables aren’t cluttered. If you are a person that likes bits and pieces, consider investing in a bedside table that has an inbuilt drawer or shelving to store necessities that don’t add to the overall style of the space. Try to avoid having more than three items on the bedside table – a light, an accessory or personal touch and flowers/greenery is more than enough. Customise the space to your needs – if you are someone who indulges in shoes, ensure you have adequate shoe storage so they don’t end up overtaking floor space. If you are a lover of books – install some wall shelving or a trunk at the end of the bed so that all your books are kept together. 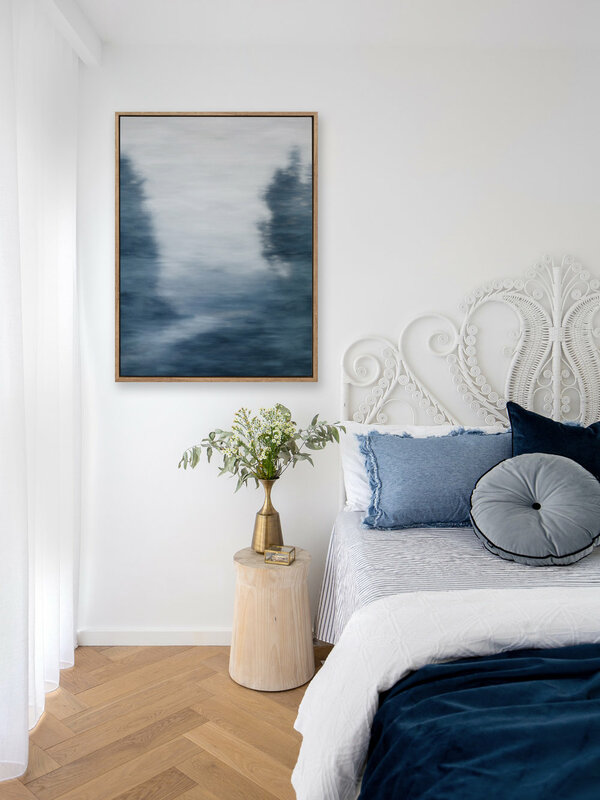 If you’re looking for something to hang on your walls that isn’t your typical framed print or artwork on canvas here’s a roundup of some of our favourite wall hangings in a variety of different styles. For smaller walls, or to fill gallery style art walls why not try a metal wall hanging from Juno + Ace (pictured above). This Australian homewares brand makes beautifully balanced mobiles and wall hangings in brass. Everything is handmade in Sydney by designer/maker Sacha Jacobsen. Looking for something woven and a little more retro in flavour? Sage x Clare have just released a gorgeous new collection of homewares called ‘Terra’ including two new woven wall hangings (pictured above and left). Seasonal hues with desert influences provide a rustic element, while knotted fringing detail gives these statement pieces a relaxed boho vibe. I love the playful shapes inspired by cacti and rainbows, and the fact that they’re quite sizeable (100cm x 120cm) – great for bigger walls and creating a real impact in your room. This wall tapestry (pictured directly below) from West Elm is so whimsical! I love the colours in this one (very on trend with its Coral Pantone Colour of the Year colouring). It would make a great piece for a small wall. US-based Anthropologie also have a colourful and eclectic range of wall hangings with boho vibes, including these four pictured below. Home Dweller (another great Australian brand) create a vintage-inspired range of fabric wall hangings and flags (pictured above) that are so sweet. I’m imagining these playful designs working well in both kids’ rooms and front entries or hallways. For beachy boho style wall hangings you simply can’t go past Byron Bay-based The Dharma Door who work with fair trade artisans from around the world. I’m in love with their new Tala and Amua wall hangings made from layers of palm leaf fringe (pictured below). They’ve also got a range of other boho-inspired wall hangings so be sure to check this store out! New Renovation Edition is Here! Straight off the printer’s press – the brand new Renovation edition is available today in our online shop. Here’s a look inside the new issue. Well at long last I can reveal our front cover of the new Autumn issue! We actually had two cover options and we put out a vote on our Instagram Stories – and this is the cover the vast majority of you loved – featuring Courtney Leslie’s chic contemporary kitchen! Our special Renovation edition is packed with renovation tips from experts in the field, and a kitchens feature with 10 kitchens that cater to all tastes. Plus you’ll find four home tours – each one meticulously renovated. And if you’re in search of a new travel destination – have you considered Brisbane? It’s an urban oasis and we’ve tracked down the most blissful places to stay, eat, drink and shop in bustling Brisbane. Available to buy now in the Adore online shop and in newsagents Australia-wide from March 14. Looking to create the ultimate laundry? Interior designer, stylist and content sourcing assistant at Adore Home, Kate Moss shares with us her top four tips to designing a practical yet beautiful laundry. In a laundry, maximise storage where possible – increasing the height of your joinery by using floor to ceiling storage cupboards will greatly help to use every square inch. Include a combination of cupboards, overheads, drawers and bench top space to really get the most out of the space. Also ensure you have a cupboard for the bigger items such as ironing boards, mops, drying racks, brooms, vacuum cleaners etc. so they don’t clutter the space. Consider built in ironing boards and open hanging rails – this will allow you to have clothes drying on hangers and reduces ironing time too. Also make sure you have enough bench space to sit a washing basket, fold clothes or rest necessities. Including open shelving will allow you to store items that are used regularly (washing powder, stain remover etc.) within easy access and can also be used to display plants, vases, candles, soaps or fresh towels – finishing touches that will give your laundry the designer look. Don’t include too much open shelving as it will create clutter. Use concealed cabinetry to create smart, space saving solutions – this reduces clutter and creates a seamless, free flowing laundry space. Ensure you install appropriate ventilation if concealing washing machines etc. Doing the laundry is bad enough so why not brighten the space a little bit with some bold wall tiles, tap ware or flooring. If you aren’t game enough to add bold tones, you can still add colour by using muted pastels or create a point of difference with varying textures. Also add interest with patterned towels, baskets, and greenery. Consider the location in the house – ideally the laundry needs to be in or near a services area, away from bedrooms and living areas so that when your washing machine or dryer is in use, it doesn’t resonate throughout resting or entertaining zones. Also, ensure it has reasonable access to a clothes line or drying area. In this laundry pictured above, designed by Julia and Sasha, they’ve opted for a window door to let plenty of natural light in, and the door obviously makes it easy to take washing out to the line. Short on space? Consider underutilised spaces such as hallways, or even bathrooms to create a laundry nook with sliding doors for a space saving solution. 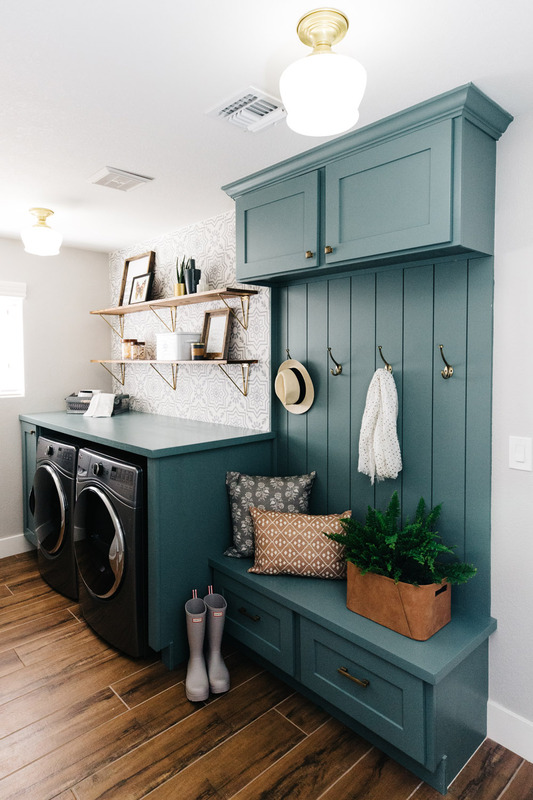 In this laundry nook pictured opposite (designed by Kate Cooper Interiors), she created a laundry in the hallway by using the space which used to be a storage cupboard. Consider combined appliances to save space or stack washers and dryers on top of one another like Kate has done below. Last but certainly not least, remember that the finishing touches can really complete the space. Artwork, display shelving, wall hooks, baskets, nice containers, towels and even plants can all help to create a beautiful laundry. Also if space permits consider combining a mud room with the laundry like in the laundry shown below left. 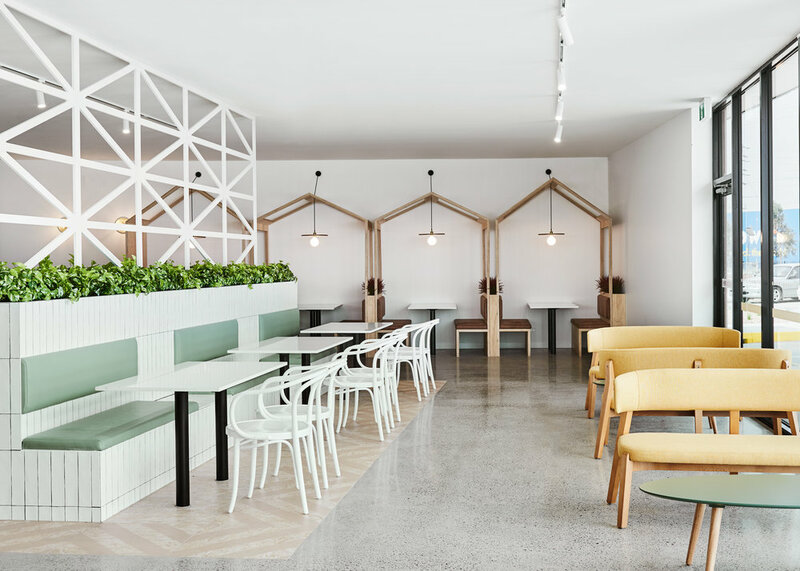 Talented design duo Alisa + Lysandra were hired by Caltex to weave their magic and create a beautifully designed interior at The Foodary, Derrimut. 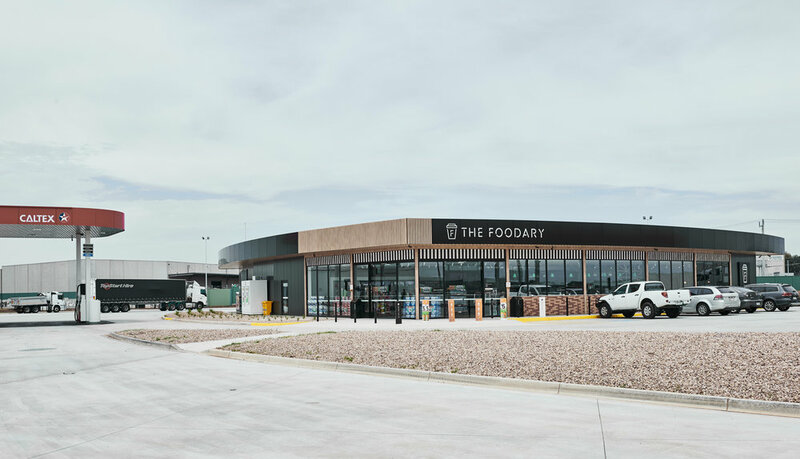 The Foodary in Derrimut (located 18km west of Melbourne’s CBD) is the second project Alisa + Lysandra have worked on with Caltex, following the successful launch of The Foodary at Altona North earlier this year. While offering all the essentials needed to keep moving when on the road, such as energy drinks, phone chargers, snacks and automotive products, the newly opened store has put the focus squarely back on service and the changing needs of Australian consumers. “Our customers have been telling us that service stations have forgotten about service and we have been listening,” said Helen Moore, Caltex’s General Manager of Convenience Development. “We also know that a good bathroom on the road can be few and far between, if available at all. It’s why we’ve taken a leap with this new store and enlisted the talents of Alisa and Lysandra, best known for their bathroom designs when they won The Block in 2013, to design bathroom and shower facilities that will change customer perceptions of what to expect when they visit this store,” Helen said. If only all service stations looked like this. Road trip to Derrimut anybody? Today we’re diving head first into Urban Road’s most sophisticated collection to date – and we’re in total awe of this whimsical collection of art prints. Taking you on a journey through oceans and wide, open spaces; past colourful creatures, and through a kaleidoscope of botanicals, Urban Road’s new collection is a celebration of adventure. Like a trick of the light - by adding a dash of colour here, and a touch of whimsy there, Odyssey beckons you to come and delight in the rediscovery of ordinary things, to wonder with brand new eyes at the beauty of natural form. Drawing inspiration from the intrinsic sense of wanderlust that lives within us all, the collection has been meticulously designed and curated by Urban Road’s Creative Director, Suzie Atkin – her sole desire to help us dream. The sophisticated colour palette intertwines soft, earthy base notes, accenting them with tones of brightest vivacity, like jewels set in a crown woven from leaves and branches. Choose from unframed or framed prints on paper, or premium canvas (which can also be framed) in a variety of sizes to suit your room. Click here to shop Urban Road’s new Odyssey collection.